Sold out- Visit www.WoodGasifierplans.com for more info. Turn wood into free fuel. 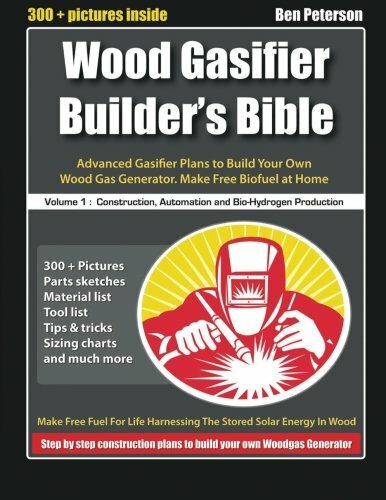 The Wood Gasifier Builder's Bible is a step-by-step construction manual to build a powerful woodgas generator with advanced features, yet needing only a minimal build budget. Wood gasification extracts the stored sunlight in wood to create a gaseous biofuel rich in hydrogen. It's like having your own personal scale natural gas refinery. How would you like to make your own free fuel... for life? Cut your utility bills, alt fuel vehicles and farm equipment or just go way off-grid. It's all possible using locally available wood you can pick up off the ground and a little known technology that helped kick off the Industrial Revolution. Does it work? It powered 1 million installations in Europe during WW2 and saved the continent. Now, this new book builds on those traditional WW2 designs and improves them dramatically with automation and advanced heat recycling for better performance and stronger, cleaner gas. This book is for you if you are a: biofueler, solar panel owner, back to the lander, off-gridder, hydrocarbon hacker, hydrogen enthusiast, prepper, patriot, survivalist, permaculturalist, welder, engineer, fabricator, blacksmith, wood worker, alternative fuel researcher, WW2 buff, inventor, tinkerer, or just a curious minded problem solver. Finally a construction manual that spells it out step-by-step and divulges the secrets to the lost art of wood gasifier construction in easy to follow detail. A must-have book in your library. Do it right the first time and save enormous amounts of time and money. The Wood Gasifier Builder's Bible will show you how. Ben Peterson is an award winning innovator who's work has been featured in Popular Mechanics, National Geographic, Mechanical Engineering and the Clean Tech Open to name a few. His area of focus is turning sunlight into fuels by combining modern solar technology and bio-refining processes to replace dirty petroleum and create a zero waste world. He is the Founder of Victory Gasworks and the Chief Innovator at the Solar Power Society. His background includes 20 years in the manufacturing trades where he started as a 15 year old fabrication prodigy in the Pacific Northwest. He's not always easy to get ahold of, but you can usually track him down at www.SolarPowerSociety.com where he teaches the next generation of innovators how to harness the sun to make a better, cleaner world.